Primitive Daisy and Heart Hand Painted Oval Stack Boxes Set of 3. 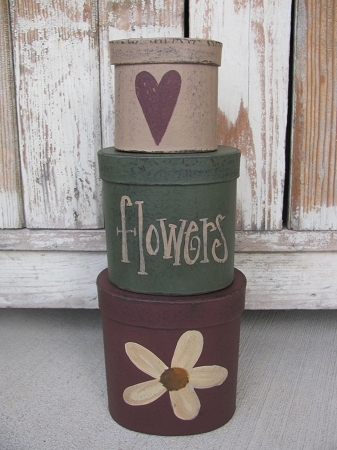 I love stack boxes, they are so much fun to decorate with. Fit in small spaces, shelves, kitchens and more to add a seasonal or every day touch. They nest inside each other so they don't take up too much room while storing them away for the season either! Size stacked is 12" H x 5" W. For this set, I've painted a daisy on the bottom box, which is burgundy. The middle box displays the saying, choices are available, so pick your favorite. Shown with Spring Thyme. The middle box has been painted Garden shed, which is a medium sage green. Lastly, a khaki tan colored box displaying a primitive shaped heart. All boxes and lids are distressed and stained for a primitive look! Hand painted, designed and signed by Heidi.